I just upgraded my ancient tablet to a Samsung Galaxy Tab S2 (I got a pretty decent price on it now that the ludicrously expensive Tab S3 has been out a while) and can confirm that build 704 works fine on it, and high-rez is operating fine. The tablet came with Marshmallow, but it received an OTA upgrade to 7.0 during setup so I didn't get a chance to try 704 on Marshmallow, but it's fine on Nougat. Note: I first tried an in-place upgrade over the release build, but that did not work (it kept giving a FC when I tried to start the app) so I uninstalled the release build and clean installed 704 and that worked. 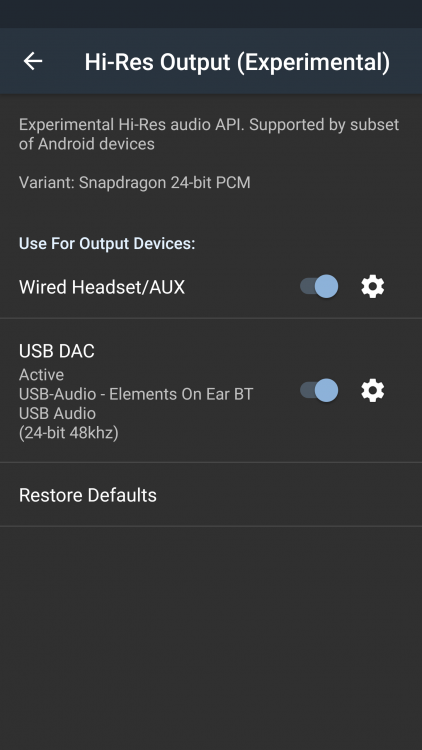 Make sure you are using Poweramp build 704, not 703, and see if that helps. 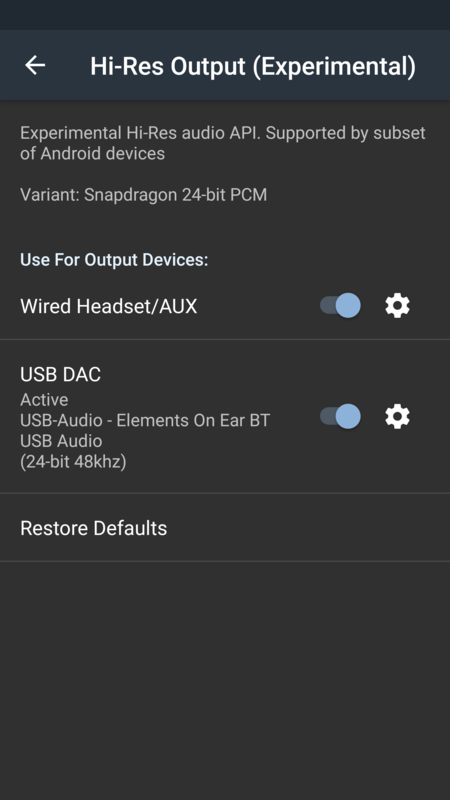 It works with Huawei P10 Nougat..
How do i find audio info? I just have 703, cant find out how to download/update to 704?? Where do you download Hi-Res Audio music? I currently only have CD ripps in flacs, som of them labelled High res by Sony..
See the Downloads tab at the top of this page, you can download 703 or 704. I have the 704 now, how do I find Audio info screen?? Then please post the full details of your device in the High Res Requests thread. I have downloaded High res Flac and DSD in 24bit, My Huawei musicplayer and Sony musicplayer plays this. Then I will join fullversion Poweramp. It's been said before but I'll just confirm. Axon 7 (snapdragon) worked on Marshmallow with 703, but after upgrading to 7.1.1 both 703 and 704 don't work. 704 gives the option but says output failed as soon as you plug in the audio jack. Hey Max, how about compiling me an Axon 7 compatible apk of version of 704 and I'll paypal you $100? 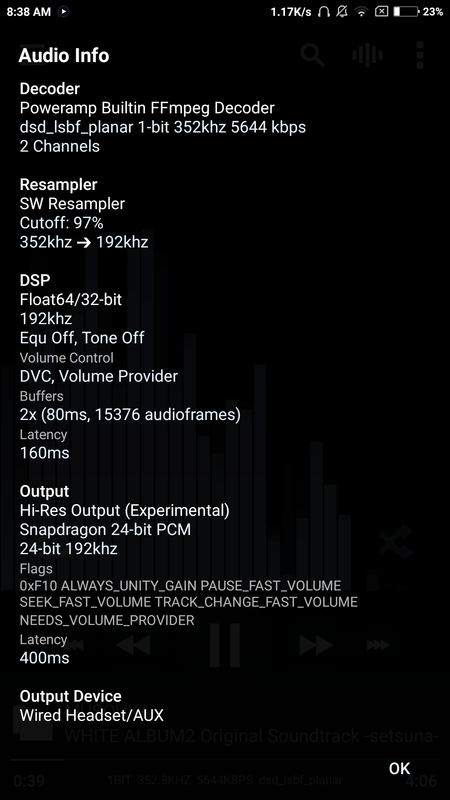 I know beta 3 is in the works, but as nice as a UI update would be, I'd just like my audio to work well. My Audeze's are so sad with all these downsampled FLACs. Mi Note 2 at Android 6 works perfectly. Don't upgrade to 7.0 yet tho, as it won't work anymore. Waiting for The final release. HI Res doesn't work with wired headset (as I previously reported). BUT I'm trying out Monster headphones with a USB cable and I think Hi Res works with it? Is that what this says? If so, weird! Totally new here. Have an Nvidia Shield TV 16Gb 2017 version running Android Nougat. Large number of hires flac files (mostly 96k 24bit, one at 192K). Here is the catch: most are 5.1 surround. I have found comments over a number of sites that state that the Android OS (standard or TV OS) will not support hi-res surround audio files. Regardless of device hardware. Can any of the android tech gurus here comment on this? 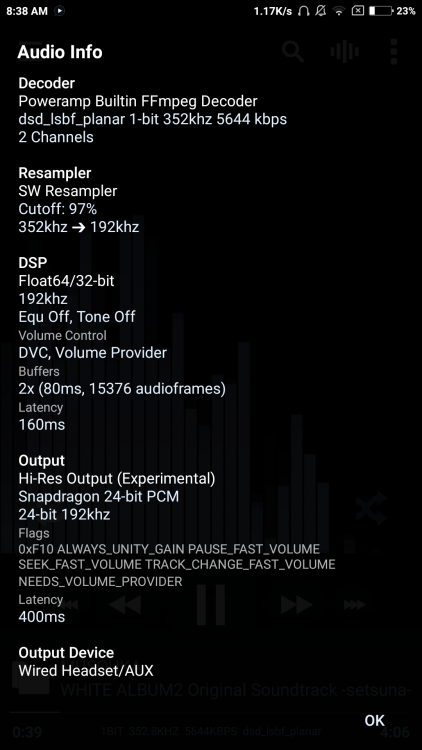 Poweramp does not support multi-channel surround sound, and I think you'll find that any sort of support for 5.1 beyond the normal 48K DVD/BluRay sampling rate is pretty rare. So I am finding, yet I am sure there is a demand for it. Hi-res surround music tracks are supported via pass through on the shield, but no music player supporting playing surround hi res flac audio files. Very disappointing. Still wanting to know if this is prevented by the Android OS (or Android TV OS) or simply because no developer has seen the need for doing this. Well there's you at least. I can't say I've ever heard anyone else mention it though. To be honest, I've never even come across any 5+ channel source material at those sort sort of rates. The files must be HUGE! It has to be added as an output path for the music to the dac, if it does not have a multichannel path than you have no chance of playing back a real multichannel recording(multichannel is 4 or more channels here). Most devices don't have one, verry rarely does one have it. Standard is the mono/stereo paths. You can check in your audiopolicy.config file what your devices supports. 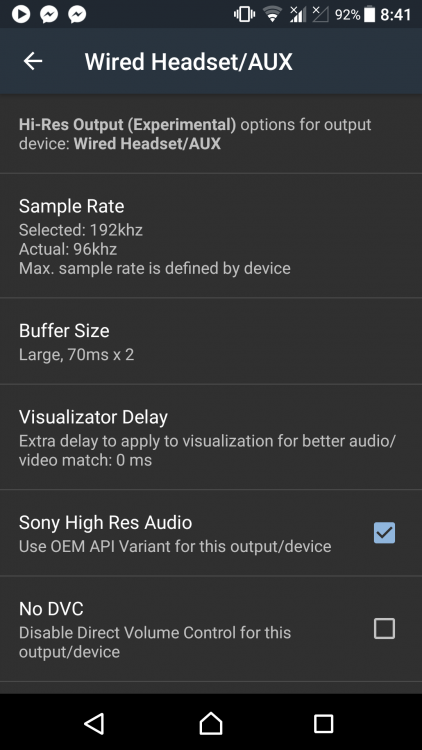 Does sony xperia z5 sample rate only at 96 khz? Does version 704 work with Marshmallow? Yes. It's basically just 703 with a few extra tweaks to help make Nougat devices more compatible, but it should be fine on older devices too. I was running it on KitKat for a long time, and now on marshmallow. Unless you are running a nougat system, you probably won't see any difference between 703 and 704.